The exact date of this photo is not known. However it dates from sometime after 1897 when the church chancel was completely re-built and the east window raised but before WW1 when the small cover that can be seen through the castellations was built at the top of the church tower stairs. 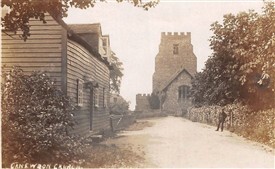 The growth of the chestnut trees on the right and the ivy on the corner of the chancel suggest it is nearer to WW1 probably around 1913. The wooden building on the left is Vicarage cottage, this building, that survives today, is often referred to as ‘the old school house’. However as it turns out this is not the whole story as there were in fact two schools in Canewdon. The Churchwarden’s and Overseer’s accounts indicate that a school was established for the poor of the village in what is now the vestry area of the north isle of the church in 1730, this proved inadequate so a new school was built on charity land close to where Canewdon School Hall is located today in 1777. The accounts from 1731 record the names of the teachers employed in this charity school that was intended for the poor of the village. Although known as the ‘free school’ each pupil paid a small daily charge that could be waived by the schoolmaster if the financial situation of the family warranted it. Those families who were wealthier would pay for home tuition of their children. However in addition in 1799 Rev. William Atkinson (curate 1797-1810, vicar 1810-1847) who by the standards of the day was a wealthy man with independent means, had a cottage re-built in the vicarage grounds for use as a school including a residence for a teacher. The pupils attending paid weekly for their education and were about 20 in number it would appear that this school was intended for the more affluent families in the village. This is the building in the photo that is now known as Vicarage Cottage and it is clear today that the building has two distinct parts, the school master probably living in one end and the school room the other. Although there were two schools in the village at the time only one teacher is mentioned in the overseer’s accounts as Rev. Atkinson appointed and paid the second teacher directly and no doubt kept any surplus from the fees paid by pupils! To confirm this in 1808 Rev. Atkinson stated in a national audit of schools that there were two schools in Canewdon one supported by the parish rates the other without any endowment whatsoever. Ten years later in another national questionnaire about schools again Rev. Atkinson was able to say that there were two schools in the parish, this time stating that there were about 20 pupils in each. Later the 1841 census lists Stephen Clay as the schoolmaster and John Haye in the ‘School House’, the later almost certainly Vicarage Cottage. It is thought that the school remained in use in Vicarage Cottage until 1847. However by the time of the 1851 census there is only one teacher, George Benton, listed for Canewdon. In summary, Vicarage Cottage was indeed a school from 1799 to 1847 but it was totally independent of the other school in the village that survives to this day on land owned by the Canewdon charities. This page was added by Brian Meldon on 06/09/2016.